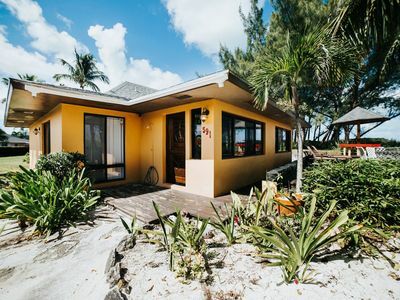 Welcome to “Cloud Nine”, a beautiful, spacious beachfront home located on the most gorgeous beach in all of Great Exuma. 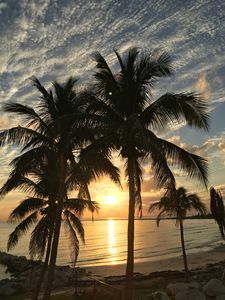 You’ll experience miles of uninterrupted white “sugar sand” beaches, and stunning views of crystal blue water with offshore cays in the distance. Cloud Nine is a newly built house designed to highlight views of the beautiful turquoise water from almost every room. It has a generous 2,600 square foot open floor plan, with an additional 600 square foot second floor balcony overlooking the water. Perfect for watching the sunrise with your morning coffee or sipping evening cocktails while watching the sunset. 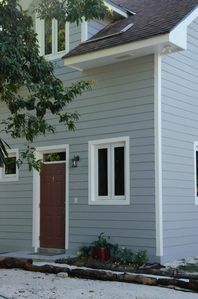 The home has been tastefully yet comfortably decorated with a coastal feel. 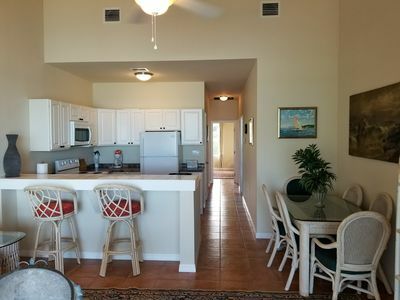 It is fully tiled, and there are ceiling fans in every room along with central air conditioning. 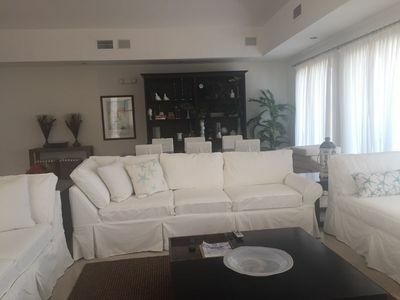 The living room has oversized sofas, stunning ocean views, and French doors leading out to the balcony. There is a large HD flat screen TV, DVD player and an extensive DVD library. The large dining room table seats 10-12. The modern kitchen has stainless steel appliances, including a dishwasher, microwave, full-sized fridge and oven. It has a breakfast bar with 4 barstools for additional seating. It is fully stocked with all of the cookware, place settings and gadgets you’ll need to prepare even the most lavish meal. Feel like grilling up the fish or lobster you caught that day? No problem, there is a gas grill located right outside the kitchen, on the back veranda. There is also a laundry room with a full-sized washer and dryer. All four bedrooms have ample storage with oversized closets and dressers. 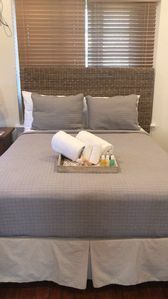 The spacious master bedroom has a king sized bed, en-suite bathroom, spectacular ocean views and tall French doors leading out onto the second floor veranda. Bedroom 2 has ocean views with a queen bed and floor to ceiling French doors leading out onto the veranda. 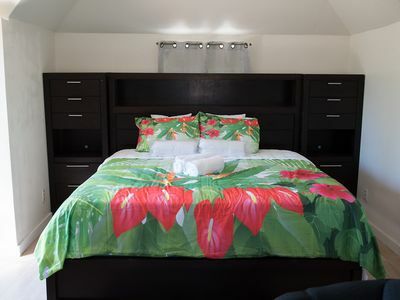 Bedroom 3 has a queen bed and private en-suite bathroom. 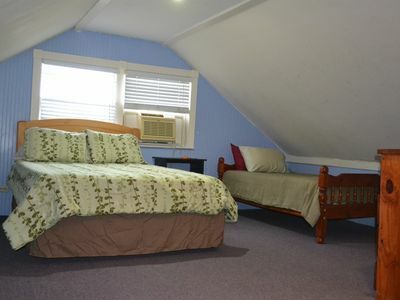 Bedroom 4 has two twin beds and a side ocean view. 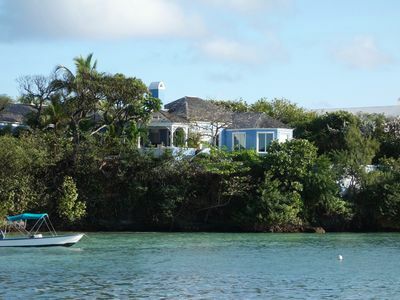 Relax and enjoy the beauty of Great Exuma from the unhurried, casual atmosphere of your own private home. 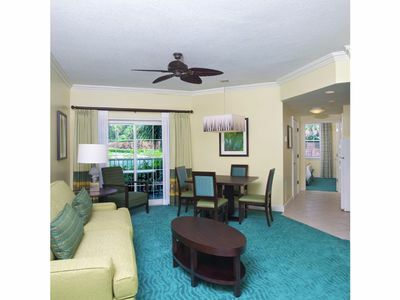 Your family will make the memories of a lifetime here! Things to experience: If you’d like to explore the nearby islands and cays, there are endless choices: You can rent kayaks, jet skis or Boston Whalers; take a water taxi to famous Stocking Island for lunch and volleyball; hire experienced bonefish or lobster guides, or charter a local boat and captain to give you an unforgettable tour of the famous islands and landmarks in the Exuma Chain. 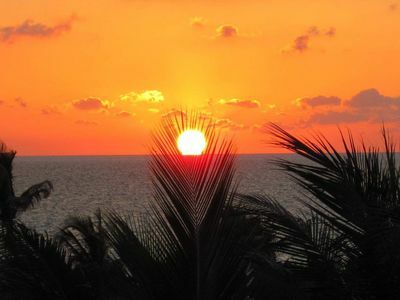 The Sandals resort at Emerald Bay and the Greg Norman golf course are 15 minutes away. 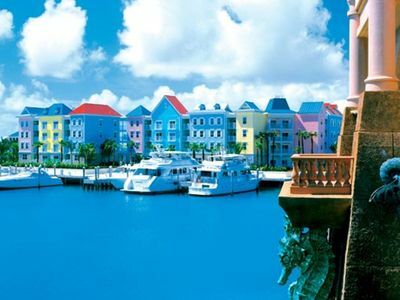 Grocery stores, gas stations, car and boat rentals and taxi services are available in the nearby capital of Georgetown. Although Cloud Nine offers every amenity you need to enjoy home cooked meals, don’t forget to try a local restaurant, which can range from the simplest open air beach dining to fine dining at local resorts. Sampling fresh conch salad or fritters is a rite of passage in Exuma! 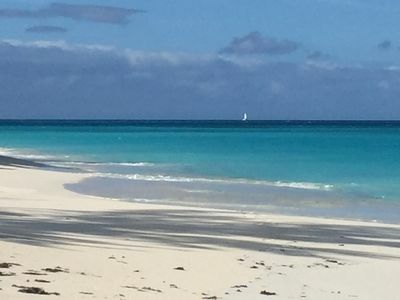 About Great Exuma: The Bahamas have the clearest waters in the world, with visibility of over 200 feet (61 meters). 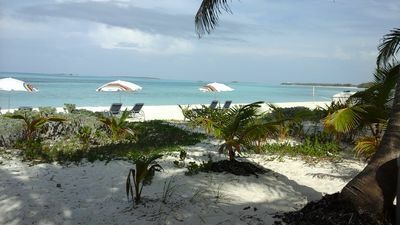 Luckily for you, Great Exuma is known for having the most beautiful beaches of all the Bahamas! 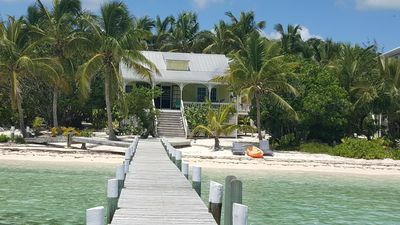 If you enjoy sport fishing for bonefish or blue marlin, then this is the destination for you. 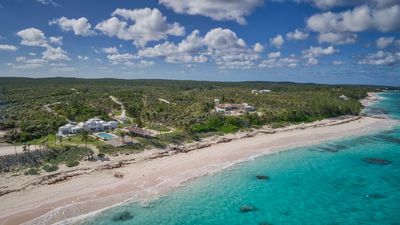 You can snorkel or scuba dive while exploring the spectacular reefs and blue holes found around the tiny islands and cays that make up the Exuma chain. 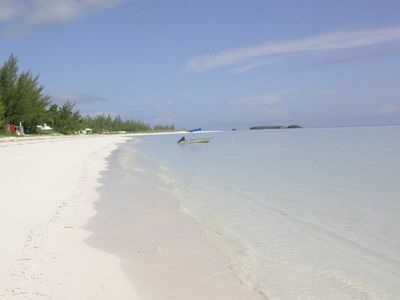 Or simply relax on the beach with the clear, calm turquoise water at your feet, soaking up the warm sun. 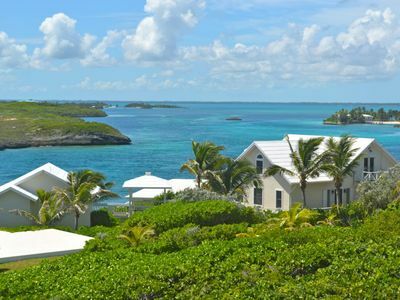 Remember, you won’t find giant cruise ships or huge crowds in Great Exuma – there is a population of only a few thousand people and no crime. Meeting all the friendly, welcoming locals is part of what make you fall in love with this beautiful jewel of an island. 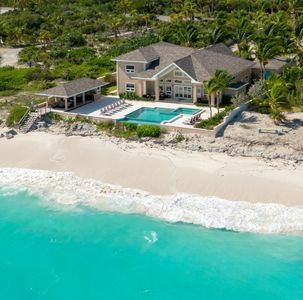 Luxurious 4 bedroom Home located on the Private Island at Bimini Bay. Stunning views from every room.. w/ a private pool, and perfect for lounging!